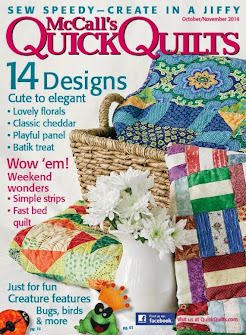 Congratulations goes out to Just Pam, the winner of a brand new issue of Quiltmaker's 100 Blocks, Volume 14. Pam commented, "I like the gray and scrappy version best." Thanks, everyone for participating. It was fun to read all the comments about color combos. 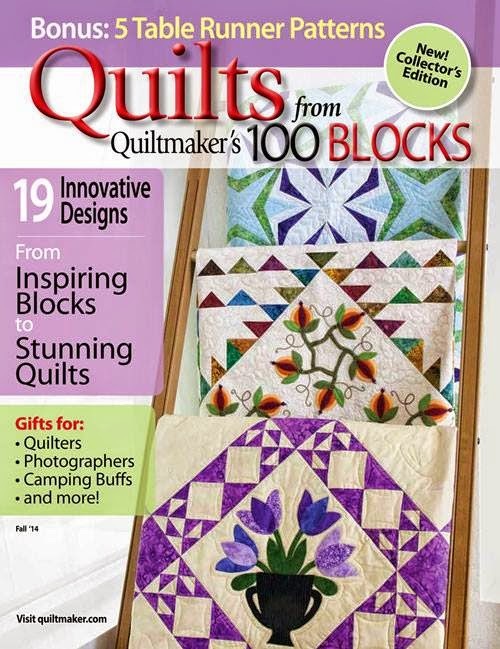 If you weren't lucky enough to win a copy of Volume 14, you can pick one up at your local quilt shop, or order online here: 100 Blocks, Volume 14. 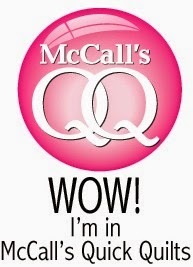 To visit the Curlicue Creations shop, click here: Curlicue Creations Shop. 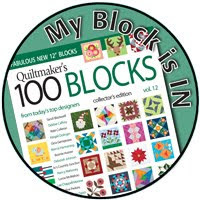 Hello, and welcome to my little segment of Quiltmaker's 100 Blocks, Volume 14 Blog Tour. I'm so happy you stopped by. It's the last day of the tour. 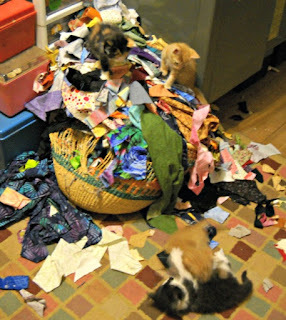 I hope you've been visiting the designers all week long. It's so much fun to see what other people are making and hear about the inspiration behind their blocks. 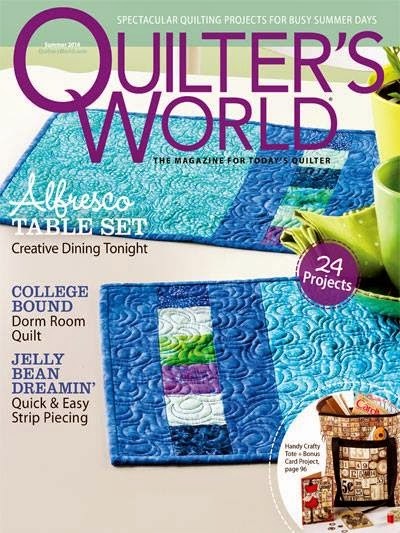 My block for this issue is "Twirly Dot". It's block #1354. 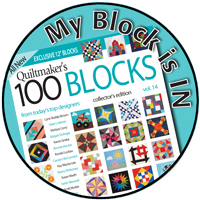 The pattern for my block appears on page 38 in the Mixed Technique section of the magazine. 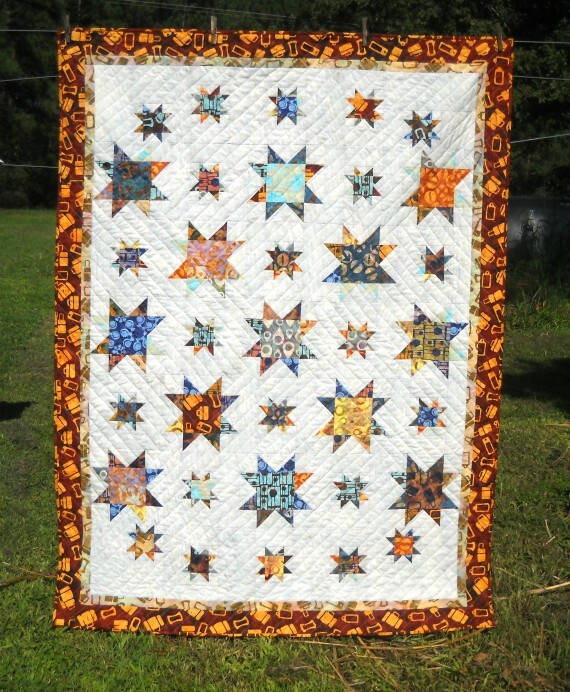 Twirly Dot is such a fun block to sew. 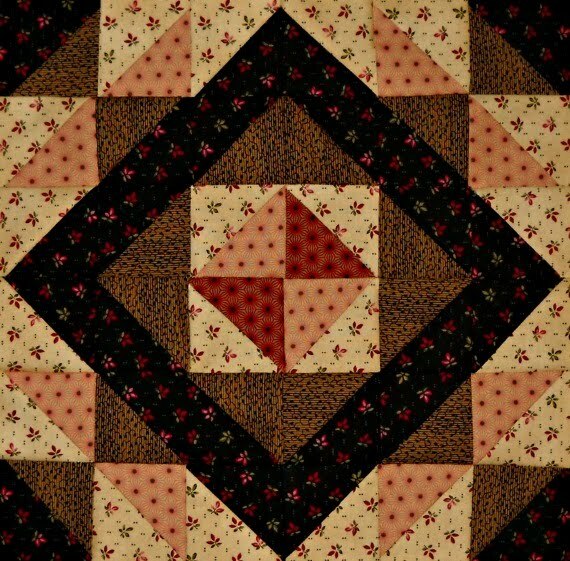 The piecing part of the block is quick and easy. 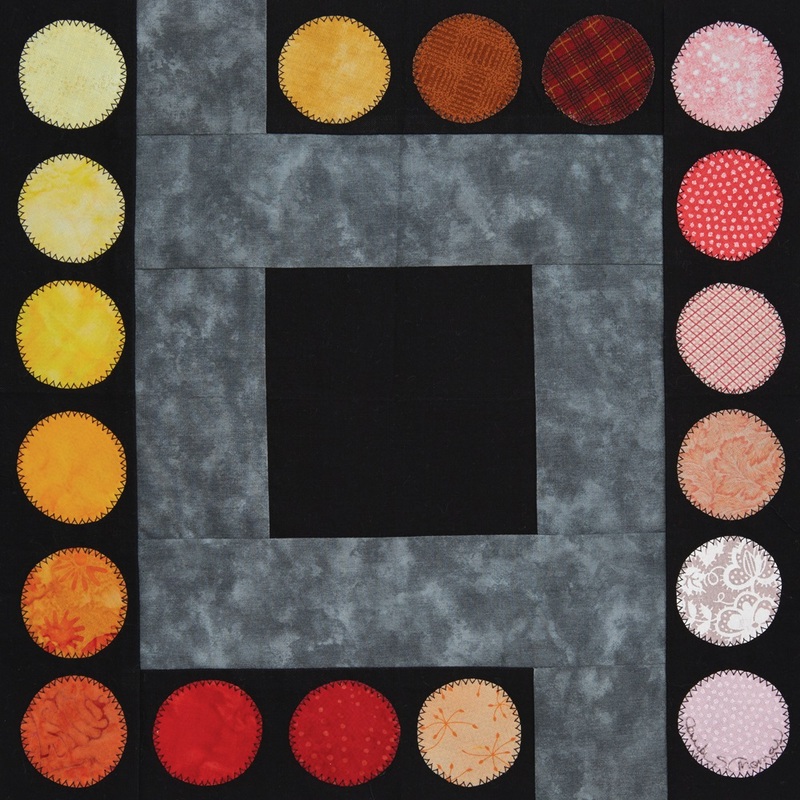 The color placement of the dots allows you to utilize your artsy style, plus it's a fabby block for digging into your scrap basket. 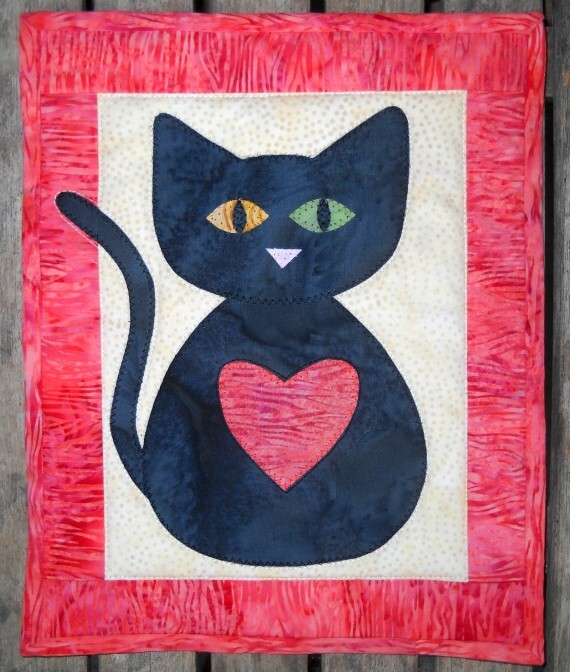 If you don't care for the black background, consider using gray for the background fabric and white for the strips. For a beachy look, use white for the background, sand for the strips, and various blues for the dots. Maybe your stash has a lot of one color in it. I seem to have more blue than anything else. 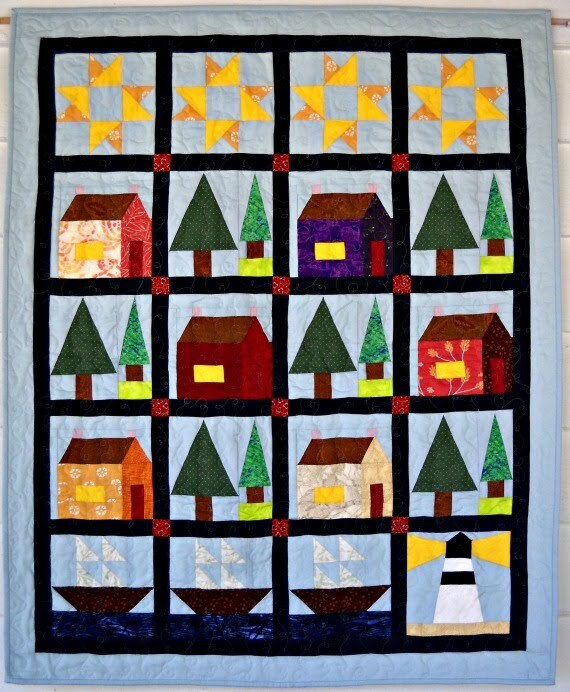 You could sew a Twirly Dot block with a black background and blues (or whatever color you have handy) for the strips and the dots. Another option would be to sew the black and grey pieced blocks, and then randomly cut and place different color dots from your stash for a scrappy look. Fun! And now...for the giveaway. I know you need a copy of Volume 14 for your collection. Just look at all the colorful eye candy on the cover! 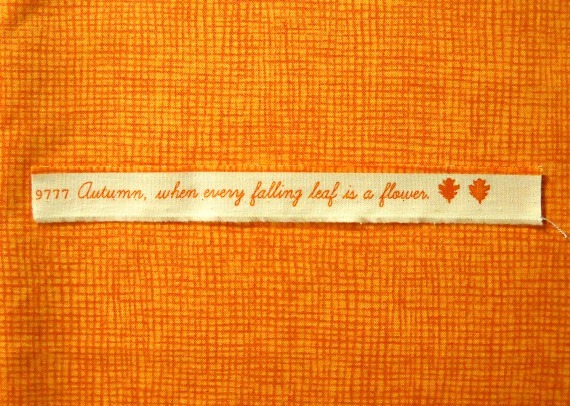 It makes me smile like sunshine through the Autumn leaves! I hope I've inspired you with some fun color possibilities for the Twirly Dot block. 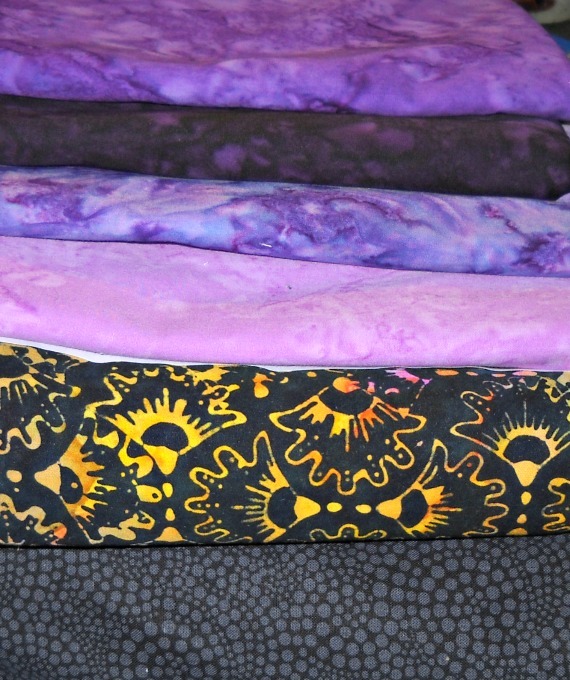 What is your favorite color combination? 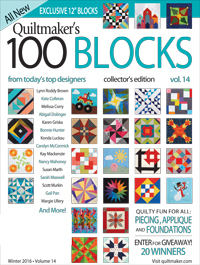 Leave a comment below, and you'll be in the running for your very own copy of Quiltmaker's 100 Blocks, Volume 14. I'll randomly choose a winner for the issue. 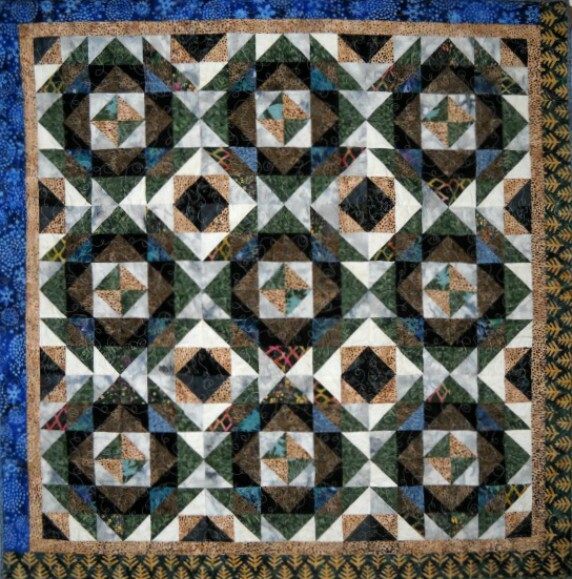 To return to Quilmaker's blog, click here: Quilty Pleasures Blog. Good luck and thanks for stopping by. 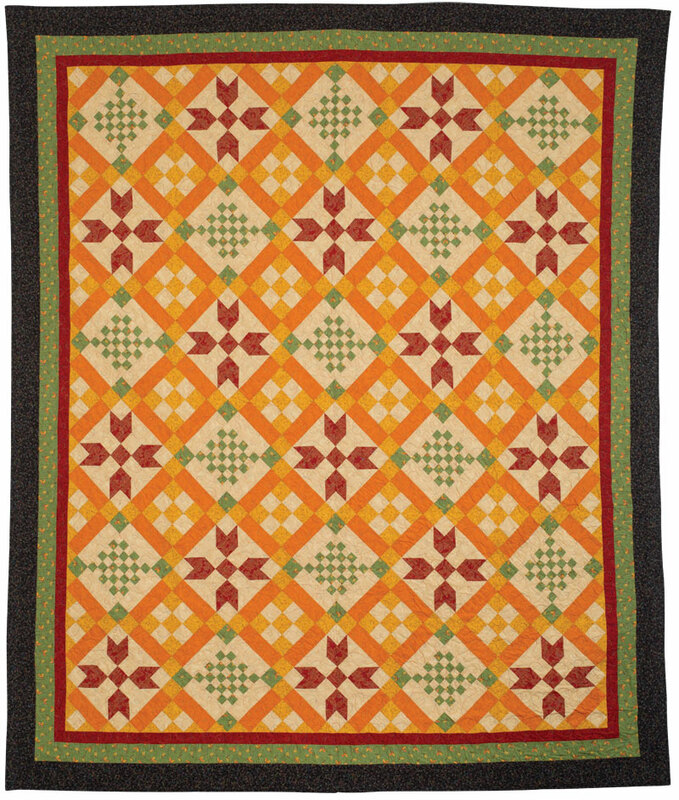 Today I'm featuring the "Remember Me" quilt. 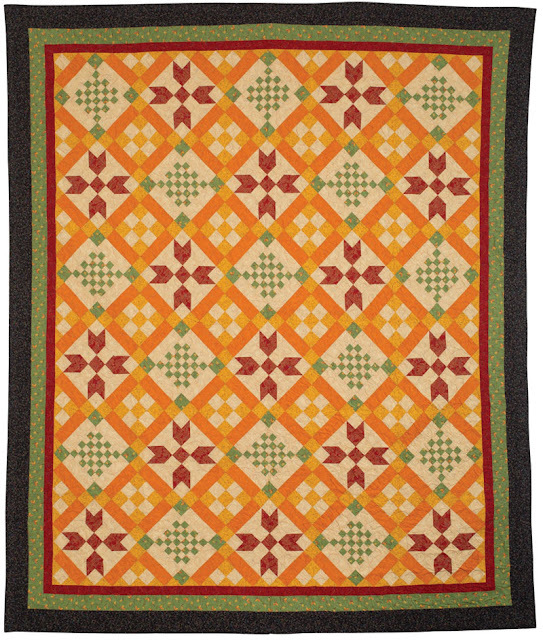 This quilt and pattern appear in the October/November 2016 issue of Quilter's Newsletter Magazine. 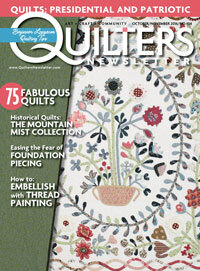 Just in case you haven't heard, this is sadly the very last issue of Quilter's Newsletter. It is such a bittersweet feeling for me. 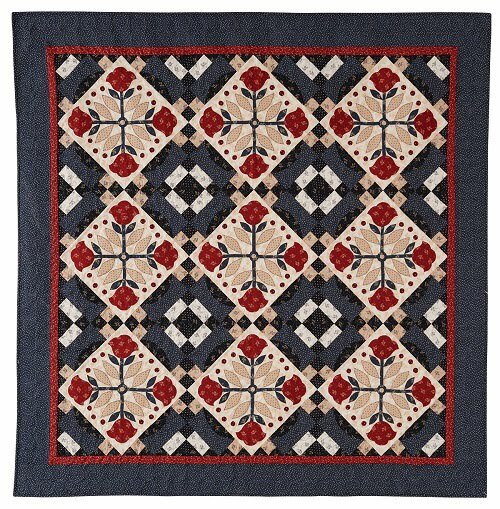 This is the first and last pattern I've had published in Quilter's Newsletter, I doubt I would have begun quilting without it. 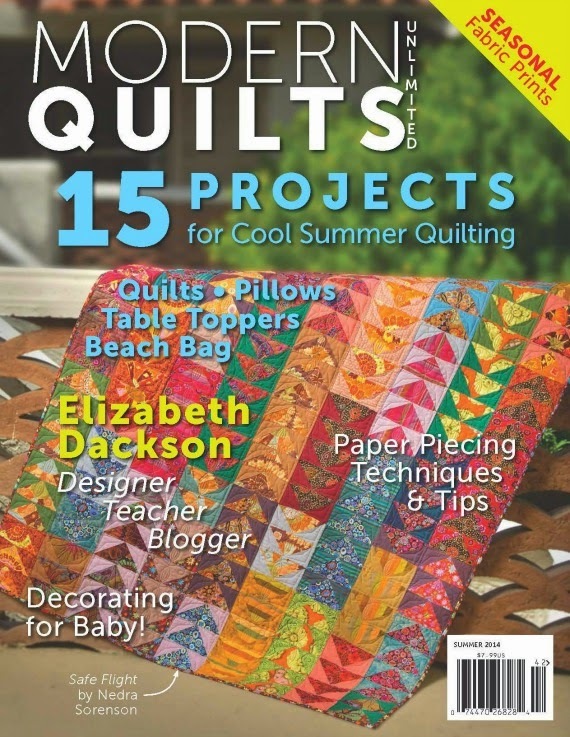 This magazine is what inspired me to learn to quilt. 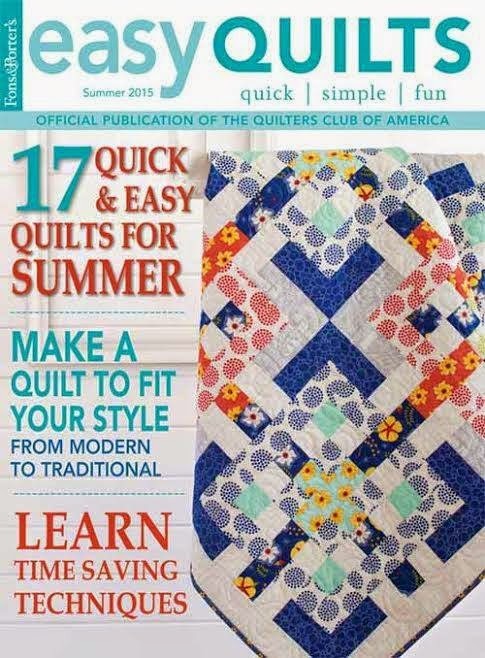 My Mother taught me to sew, but Quilter's Newsletter taught me to quilt. 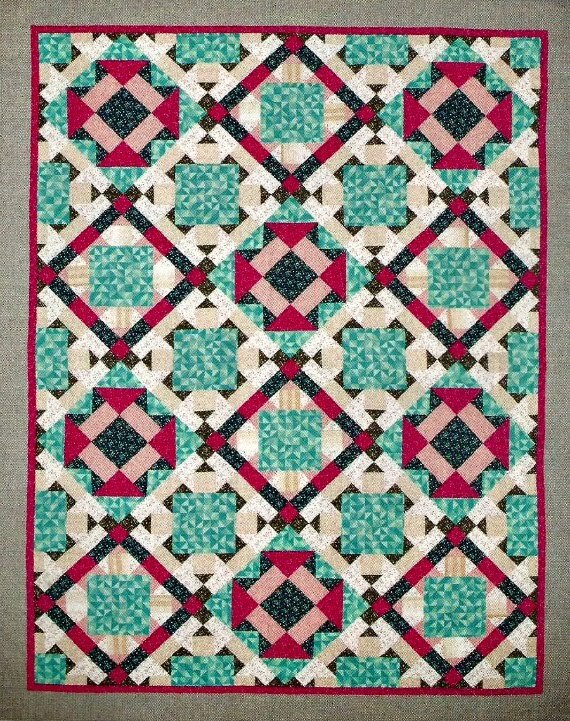 Quilter's Newsletter stretched my imagination; showed me there are no limits to what you can create with needle and thread. 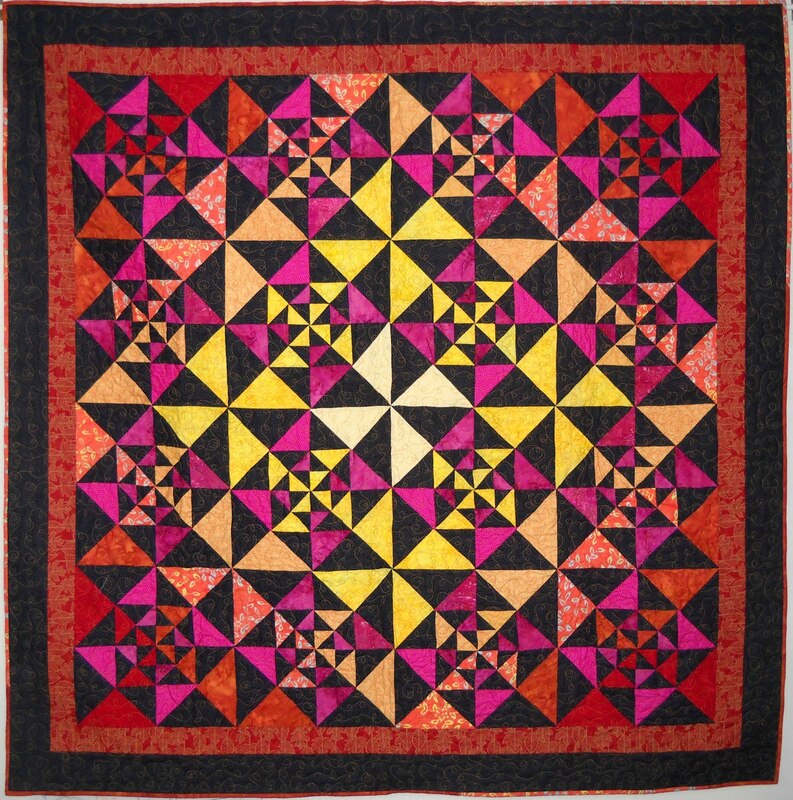 Thank you, Quilter's Newsletter for launching me on this life's journey, filling my head with dreams of color and texture. I feel blessed to have shared in a small piece of your legacy. 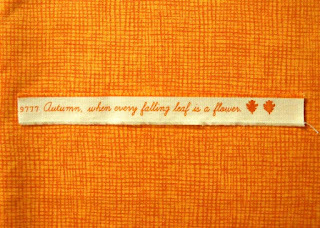 "Autumn, when every falling leaf is a flower"
Beautiful Batiks - Sneaky Peek! 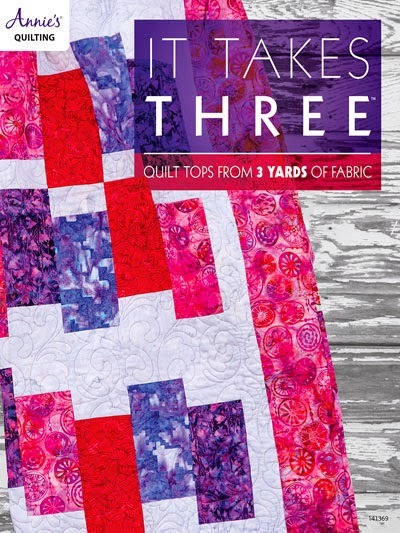 Today I'm cutting into these gorgeous fabrics from Timeless Treasures. I just love purples...sigh! What's on your cutting table? Coming soon! 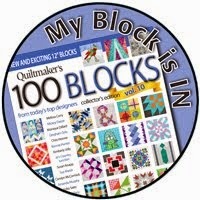 Quiltmaker's 100 Blocks, Volume 14 and the blog tour, too. Be sure to mark your calendar for the week of November 14th through 18th and visit Quiltmaker's blog, Quilty Pleasures each day of the tour for a list of participating blogs and a chance to win fabulous quilty prizes! If you've never done a blog tour before, you are in for a treat. 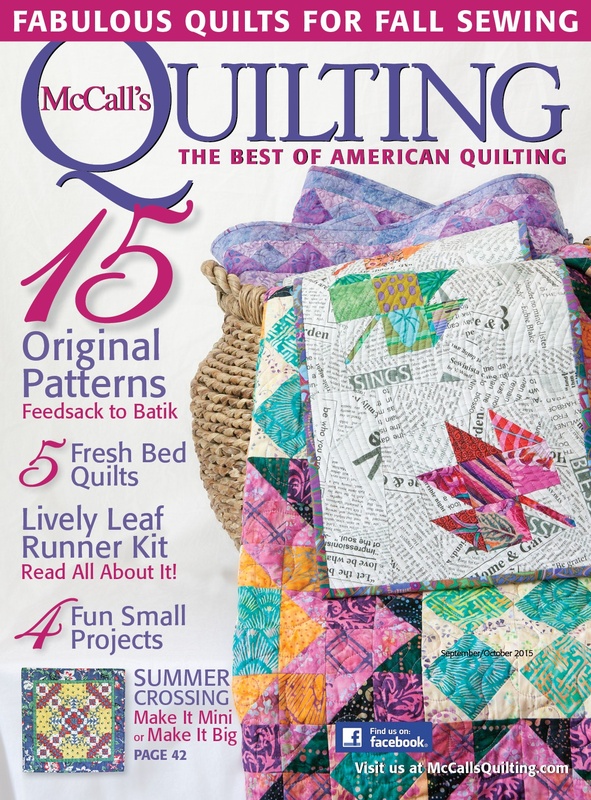 Here's a peek at the cover of the upcoming issue. I'll be giving away a copy on my day, Friday, November 18th (also my birthday - how cool is that?). I'll also be revealing my block for this issue, and maybe a surprise or two. 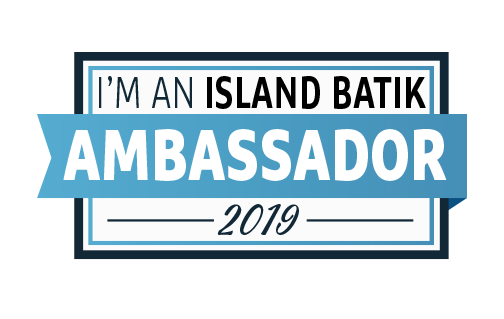 See you then!